as i mentioned in january, i love making goals and even though i set out with yearly goals for 2015, i also wanted to tackle some monthly goals so i can achieve my yearly goals. last month i did really well. while i didn’t read three books in january, i did read one spectacular book and got halfway through another really good one. and i didn’t paint both guest bedrooms like i set out to do but i painted the dining room and hallway which i wasn’t planning to do for a while doesn the road. everything else on my monthly goal list, i can proudly put a check mark next to. january crept by at a snail’s pace but i have a feeling february is going to fly with a vengeance. with andrew’s birthday, addison’s first birthday and party, valentine’s day, our anniversary, and a trip back to the snowy land at the end of the month, this month is sure to fly by in a blink of an eye. Oh man we lived totally different Januarys!! It flew by for me, and I was grasping at anything that would make time slow down! I need to get on board with the whole lemon water thing. I just absolutely hate lemon though. I'll do my best! 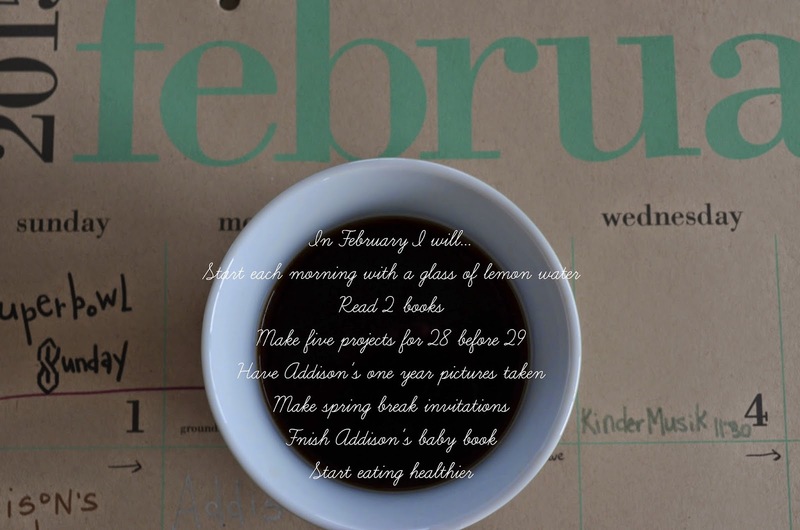 Sounds like you have a lot going on for February!! February always seems to go by really fast without any of us noticing. I started drinking lemon water every morning a few weeks ago and it has been amazing! !